Scrapbook Studio has only recently announced their brand new DESIGN TEAM for 2012. And this month they have launched their brand new DESIGN TEAM KIT. You can read more about the DESIGN TEAM KITS by clicking HERE. ...this is not the only layout....more layouts and cards will be revealed in May! 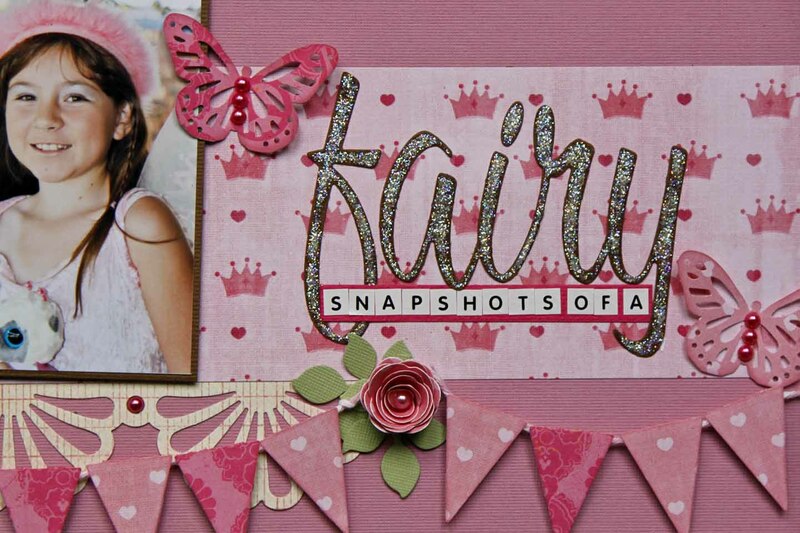 Elizna created this layout with papers and embellishments that you will find in the first ever Scrapbook Studio JBay Design Team Kit of the month! This kit was packed bearing in mind that May is the month in which we celebrate Mothers – so we kept it in shades of pinks, blues and soft greens ( you will see more of the kit as the week goes on….) This kit will be perfect for Mother-Layouts, little girl layouts, as well as Vintage layouts. 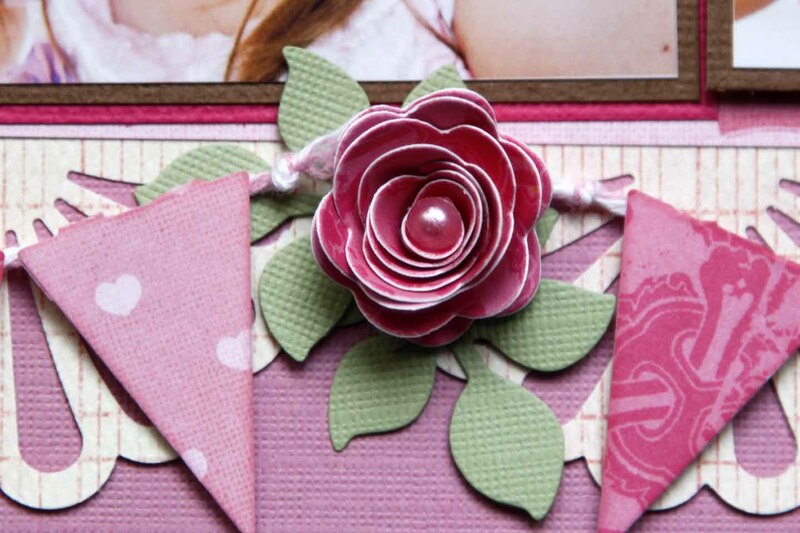 One of the other layouts Elizna created has a wonderful Vintage look and feel to it – it is still to come! 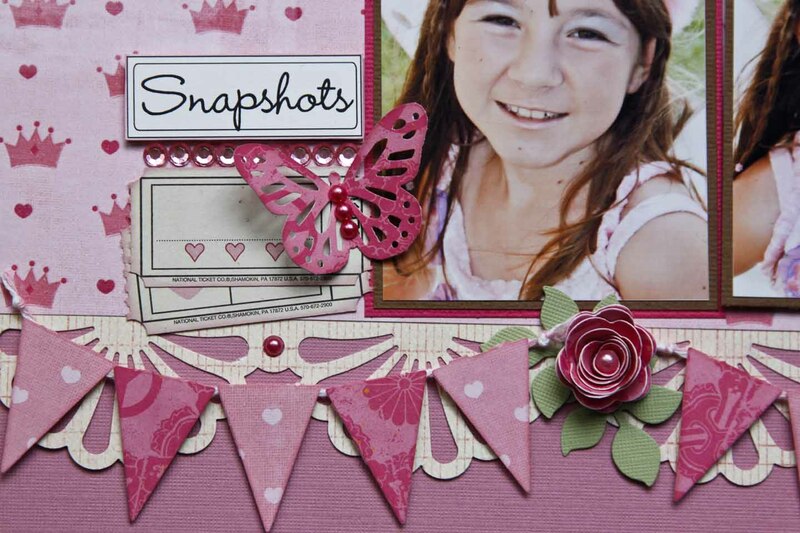 Elizna focused on the photos and the beautiful papers when she created this layout. As you can see, she really concentrated on keeping the layout elegant and simple, using minimal custom created embellishments from the papers and items in the kit. She repeated the banners all over the double page, and used die-cuts as well as punches to create accents. Her use of “white space” is also very effective and one can clearly see that her placement is well thought out – she did not “randomly sprinkle” embellishments. Candice Greenway said it very well “ a Scrapbook Page is not a cupcake. You don’t sprinkle embellishments randomly, they have to have purpose.” Of course there are exceptions to every rule, but in this instance we clearly see how the careful placement of embellishments can add to the effectiveness of a layout. This is something brand new that we are launching this month! We are so excited! We will have two – three different kits available every month. With these kits you will be able to create at least 3-4 layouts (double or single) as well as a bunch of cards! Yes, we will even show you what cards the Design Team come up with! We will have the Design Team Kit – this kit will be a random pick of the most beautiful papers and embellishments we have in the shop that can mix and match. Every month one of our Design Team Members will have the opportunity to showcase their magical creations using that month’s kit. You will then be able to buy the kit. Then we will have one or two Scrapbook Studio In-House kits. (depending on how creative we feel, there will be one or two!!!) We were exceptionally creative during the month of April, so watch this space over the next few days for some inspiration on the two in-house kits. PLEASE NOTE: these are limited kits. We will only pack 10 of each kit per month. These kits will be once off and will never be repeated. We believe variety is the spice of life, and we will work on a “first pay, first play” basis. We have already been promoting the kits in store, and we have started compiling a mailing list for those who are interested. If you want to be included in the mailing list, please send an email to sales@scrapbookstudio.co.za with Scrapbook Studio Kit in the subject line. You will then receive detailed images of the kits as well as more information on exactly how the kits will work! 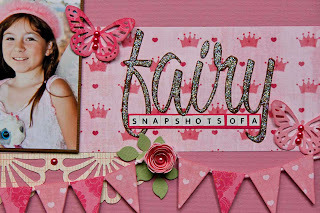 Beautiful layout with great girly colours and I love the banner.